The campaign will aim to highlight the risks of disruptive behaviour while flying. Credit: One Too Many. A campaign that promotes responsible flying and raises awareness against disruptive passengers on plane was launched on Friday by travel retailers, airports and airlines and coordinated by Aviation Minister Baroness Sugg. The first of its kind in aviation, the ‘One Too Many’ awareness campaign will aim to remind passengers of the negative impact of excessive drinking when travelling by air. The campaign is based around the idea that, despite being rare, any disruptive passenger or incident is ‘one too many’. Building on the UK Aviation Industry Code of Practice on Disruptive Passengers, the scheme unites the UK Travel Retail Forum (UKTRF), the Airports Operators Association (AOA), the International Air Transport Association (IATA) and Airlines UK (AUK) under a common goal. Excessive drinking when flying may lead to passengers being denied boarding or having a plane diverted, and in extreme circumstances up to two years in prison, an airline ban, heavy fines and a diversion fee of up to £80,000. UK Travel Retail Forum chair Francois Bourienne said: “It is an offence to be drunk on a plane. Not least to other passengers. The One Too Many campaign is to remind people of the consequences of irresponsible drinking at any stage of their journey and to highlight the fact that, while serious disruptive behaviour remains rare, it can be costly and cause delays. Other passengers become upset and a lot of holidays are ruined. The campaign has been promoted via Facebook and Instagram and in nine pilot airports across the UK, including Manchester, Bristol, Birmingham and Gatwick. 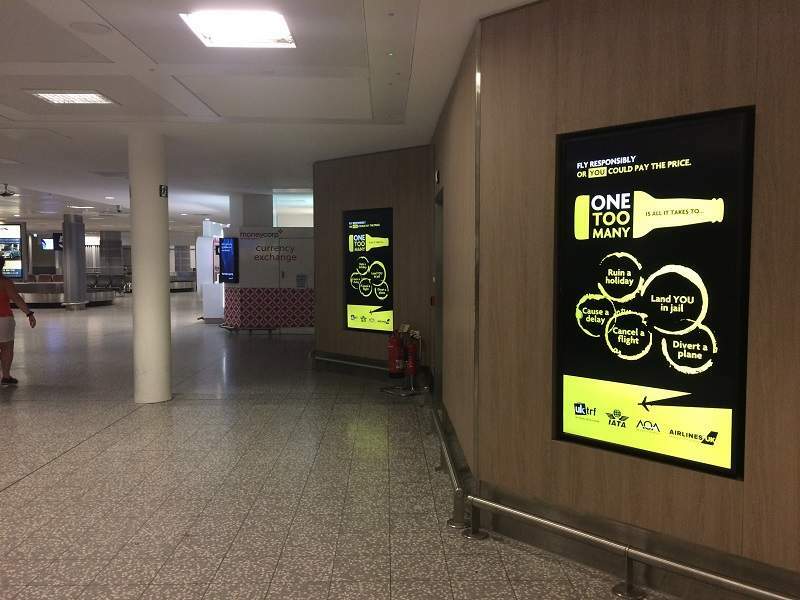 These airports will collaborate with airlines and other aviation stakeholders to promote the campaign through digital screen signage, POS display, F&B retailer notices and a dedicated police leaflet.